The puzzling fact that there are more divers per capita in high-and-dry Denver, Colorado, than any other city is explained by a large overlap in the demographics of skiers and divers. Since they typically have to fly to the tropics for the good diving holes anyway, they choose to live within driving distance of the ski slopes. Drive to ski, but fly to dive. In his Facebook news stream, author and cultural critic Jack Lynch reports that he is "still amazed to see every state that touches either the Atlantic or the Pacific is leaning toward Clinton (or, more accurately, away from Trump)." Which brings to mind an interesting observation: did you know that there are more SCUBA divers in the high-above-sea-level city of Denver, Colorado, than any other city in the US? You can't get much further spiritually from the ocean than Denver, and the reservoirs are too puny for diving. 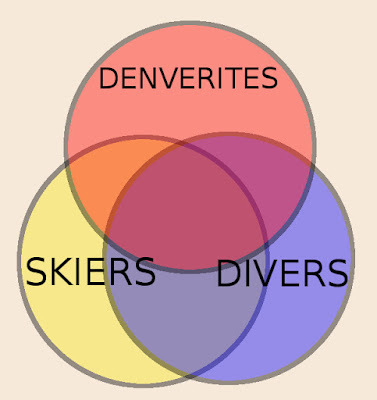 The explanation is that scuba diving and snow skiing have large overlapping demographics (this is where I get out the Venn diagrams...). My point is that I suspect similar correlations are at play in America's Bi-Coastality and Clinton support. Does that make sense or has my intuition curled up and died? Bi-Coastality defines American culture because television and film emanate from the two coasts or, more precisely, from Los Angeles and New York. When I was growing up in the 1960s, New York also seemed to be the center of all manufacturing. If I bought anything, it came from New York or from nearby New Jersey except for small, trinket-like items that were labeled "Made in Japan." When I was a kid, twenty years seemed like an eternity, but that was only how long it had been since the War, and all this manufacturing was Japan's reconstruction as it crawled out from beneath its ruins and swept away the radioactive fallout. Japan occupied the same niche that China does now, except there wasn't all the technology we have now. The breakthrough for Japan occurred with the commercial viability of the transistor, an American invention that they quickly put to good use. Indeed, most of their more sophisticated inventions were copies and potential patent violations because they did not yet have the educational base to train many engineers. Transistors in the 1960s took the place of what had been vacuum tubes in radios, and tubes required a great deal of power. Suddenly, with the transistor, tubes were no longer necessary. The radios could amplify the signal with much less power, and they occupied less space—the portable radio was born. 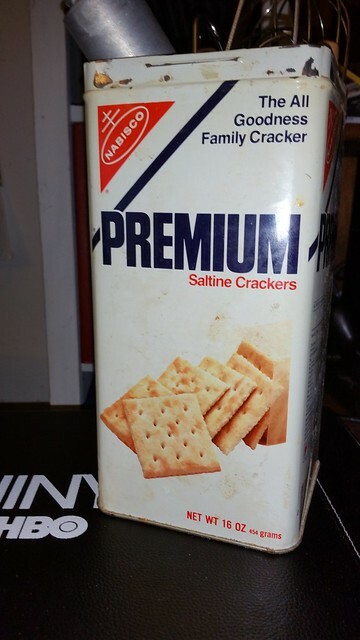 These radios were AM only, which was fine because at that time FM was a Muzak wasteland playing nothing but elevator music, and it was so calculatedly inoffensive that it was narcotic. Pocket-sized portable AM radios about the size of a pack of cigarettes had immediate appeal to the youth, and they often made nuisances of themselves in the way that kids with boom boxes would annoy people twenty years later. There are two scenes in A Hard Day's Night where one Beatle or another has one of these radios, and these days that seems like nothing special, but in 1964, when the movie was made, that small piece of electronics lay on the bleeding edge of technology. The Japanese pocket radio made Japan's ascendancy to a Third Coast of manufacturing, though American culture remained xenophobically its own, not even admitting half of its own population. It's also worth noting that the simple transistor was the first electronic part that fell under the heading of semiconductor, a technology that eventually made computers practical. second life as a bin for kitchen utensils. By 1970 the Japanese had advanced to sending small, flimsy, compact cars into the US. They were dangerous because their bodies were little more than a giant form of metal cracker box, but had I stayed out of accidents—I swerved, missed a black lab that was lazily crossing the street, and ran into a tree: fortunately I wasn't going very fast—that car would have lasted forever, but I had made an accordion of its frame. With better shipping technology, it became cheaper to manufacture goods overseas. The old Northeast economy slowed and rusted, and the whole area became known as the rust belt. Cleaner, newer technologies became the focus of the American economy, and with that shift came a shift in territory. Land and labor were cheaper in the Sun Belt, which comprised the south and the west. Cities like Houston and Atlanta boomed and sprawled, and real estate was relatively cheap. There were no unions to speak of in the South, so the old northeast bosses were left in control of piles of rusting iron and abandoned factories, and the new corporations found themselves free of the demands and strikes. Certainly unions had protected workers and brought them out of the slums of the industrial revolution, but by the 1970s they were so corrupt that they took care of the Tony Sopranos of the world and abandoned the interest of workers. As the old factories died and the new industries thrived elsewhere, the economies collapsed in Massachusetts, New York, Ohio—check out Chrissy Hynds's "My City Was Gone." The Sun Belt turned into a party of jobs and good times. Along with the power shift in the economy, there was a huge population shift out of the northeast and into the south and the west. All that was going on wasn't immediately obvious from the ant's eye view of the average human being, but a writer named Kirkpatrick Sale came out with a best-selling book with a mouthful of title that explained what was going on: Power shift: The rise of the southern rim and its challenge to the Eastern establishment. New York City is the center of the universe, so it doesn't stay down for long. The downfall hit Boston harder and lingered much longer. I will always enjoy visiting New York, but I am not fond of the cities of the south that were built so formulaically and at great speed as though by a troupe of monkeys with an architect's rubber stamps. Atlanta has its moments, but I cannot imagine why anyone would live voluntarily in Houston, a city of three million people imprisoned by their lust for material goods. The city is devoid of creature comforts on the street, and even the downtown mall never realizes its park-like intentions as I find in Baltimore, San Francisco, and most European cities. Houston is called "the poor man's L.A." with reason, so I won't visit there either except as a hasty tourist. I wanted to bookend this semi-memoir, semi-historical, semi-technological diatribe with another illustration of demographics, which I have and have not found. But I did find something interesting if not altogether germane. 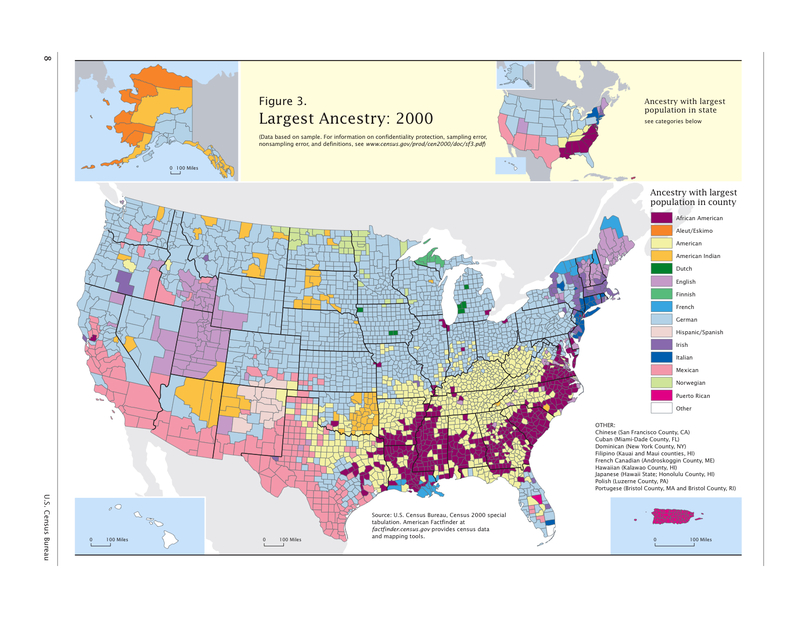 This map shows how people self-identify their ethnicity. The map makes no pretense of including everyone everywhere—that would be too much a challenge for the graphics. What it shows though is what the majority ethnic identification in each county, and I'm surprised by the result. But I will stop talking at this point and just give you the map. We can talk about it in the discussion area below, or on Google+, or on Facebook. The Birth of Venus. Sandro Botticelli.